Police say they found a marijuana-growing operation inside the duplex. 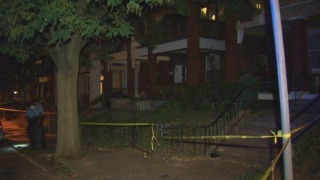 A man died and another was left in extremely critical condition after a double shooting at a duplex in the Cobbs Creek section of Philadelphia Saturday night. According to investigators, an unidentified gunman arrived at an apartment building on the 5300 block of Angora Terrace shortly after 8 p.m.
Sources close to the investigation say the gunman got into an argument with Ben Cook, who lived in the apartment. He then allegedly opened fire, striking Cook in the chest and armpit. Sources say 24-year-old Eric Clenahan, who was visiting Cook at the time, ran down the stairs when he heard the commotion. The gunman then opened fire once again, striking Clenahan in the chest and head. The suspect then tossed his gun near the scene after running out of bullets and fled on foot. Cook died at the scene while Clenahan was taken to the Hospital of the University of Pennsylvania where he remained in extremely critical condition Sunday. Police recovered the weapon and are currently questioning three witnesses, including one woman who was inside the apartment when the shooting took place. Police also found a marijuana-growing operation and about 30 marijuana plants inside the apartment. However, they have not confirmed whether the shooting was drug-related.